The best option for you to access the Internet on your #Apple iPhone 7 Plus (#iPhone7Plus) smartphone without using data is through a Wi-Fi network. Here in this post, I have demonstrated the basic standard procedures that will help you get started in using the Wi-Fi feature on this new iDevice. But before you continue, you may also want to visit our official Troubleshooting Page for iPhone 7 Plus if you are looking for a solution to a problem. We’ve already addressed some of the most common issues reported by our readers and there might already be solutions to your problems. So, find issues that are similar with yours and use the solution we suggested. If they don’t work, then feel free to contact us by completing our iPhone issues questionnaire. To get started, go to the Home screen. Open the Settings app by tapping on Settings. If necessary, tap the Wi-Fi switch to turn the feature ON. You will know if Wi-Fi is enabled if the Wi-Fi switch appears green. Alternatively, you can use the Control Center to quickly turn Wi-Fi on or off. To do so, just swipe up from the bottom edge of your iPhone screen and then tap the Wi-Fi icon to enable or disable the feature. Once Wi-Fi is enabled, you may now start browsing the web using your preferred wireless network. Scroll to and tap to select a preferred Wi-Fi network to connect to. If prompted, enter the correct Password. If you haven’t yet added or set up a wireless network, the following steps will walk you through the process of manually adding or setting up Wi-Fi network on your new iPhone. Note: Wi-Fi network information is required in order for you to complete this process. If you are not sure of which information to use, refer to the network administrator or contact your Internet Service Provider for further assistance. Make sure the Wi-Fi switch is enabled or turned on. It’s on if it appears green, otherwise, it’s off. Enter the correct network name into the Name field. Tap to specify the applicable security option for your wireless network. Among the available options include WEP, WPA, WPA2, and None. Once the Wi-Fi network is successfully added, continue to the next step to connect to the Internet using the new wireless network you have set up. After setting security option, tap Other Network (Arrow Back) located in the upper-left of screen. Next, enter the Password into the Password field. If necessary, enter the username into the Username field. In case you would no longer want to use a wireless network, then you can just have it removed from your device. Refer to the following steps on how to get this done on your new iPhone. Tap the Information (i) icon located next to the wireless network your device is connected to. A checkmark on the left of the network name will help you determine which Wi-Fi network is active on your iPhone. And that’s the one you need to tap on. Next, tap the option to Forget this Network. To confirm action, tap Forget. Removing/forgetting and then re-adding a network process is also a helpful workaround in dealing with wireless connectivity issues with your iPhone. Wi-Fi Assist is an iPhone feature that lets you stay connected to the Internet even if you have poor Wi-Fi connection. For instance, you can activate Wi-Fi Assist if you are getting a poor Wi-Fi connection and that you are having trouble loading a webpage using Safari for Internet browsing. In this scenario, Wi-Fi Assist will activate and then automatically switches to Cellular so that the webpage continues to load. Wi-Fi Assist can be used with most apps on your iPhone including Apple Music, Maps, Mail, and Safari. Wi-Fi Assist is enabled or turned on, by default. But just in case it is disabled on your device, the following steps will help you turn the feature on. Scroll down and tap the slider next to Wi-Fi Assist to enable it. Enabling Wi-Fi Assist on your iPhone 7 Plus can result to unexpected data charges due to increased data usage. For more inquiries about your data usage, you may contact Apple Support or your network carrier. Otherwise, you may opt to manage your cellular data. You will know when Wi-Fi Assist is enabled or activated if you see the Cellular Data icon in the status bar on your device. Wi-Fi Assist won’t automatically switch to Cellular if you are using data roaming. Wi-Fi Assist does not activate with some third-party apps for video/audio streaming, downloading attachments, as they might require large amounts of data to complete. Scroll to and tap Cellular from the Settings menu. Scroll down to and tap the Wi-Fi Assist switch to turn the feature OFF. Wi-Fi Assist is now disabled on your iPhone. Your iPhone supports a Personal Hotspot feature that lets you get on the Internet with your device even if you are not in range of a Wi-Fi network. All you have to do in order to get started is to set up a Personal Hotspot on your device and then you can start sharing your iPhone’s cellular data connection. Tap the Personal Hotspot switch to turn the feature on. If prompted to enable Bluetooth or Wi-Fi, tap to select your preferred option. Enter the correct password and then tap Done to continue. The Personal Hotspot is now active, allowing your other devices to connect via Wi-Fi. Some carrier’s require you to get a separate Mobile Hotspot service plan in order to use your iPhone as a mobile hotspot. Contact your carrier for more details on Mobile Hotspot usage with your iPhone 7 Plus. The Personal Hotspot option may not be available if the Mobile Hotspot feature is currently active on the account. If prompted, follow the onscreen prompts to add the Mobile Hotspot feature. Toggle the Personal Hotspot switch to turn the feature On or Off. Virtual Private Network or VPN works over Wi-Fi and cellular data networks connections. For security reasons, you may opt to set up and use a VPN on your new iPhone to allow for a secure and private connection when you communicate, or when you need to configure VPN to access or send out work emails on your device. With VPN, you all contents and data going in and out of your iOS device are secured. Select the option to Add VPN Configuration. If you are not sure of which settings to use, contact your network administrator for further assistance. Generally, you can use the settings you’ve used when you set up a VPN on your computer. You may also visit Apple Support page for VPN manuals. After you’ve set up a VPN, you can enable VPN from the Settings menu on your iPhone. The VPN icon will be shown in the status bar when you connect using a Virtual Private Network. You may need to install a VPN app from the App Store that configures your iPhone to access a network. In this regard, contact your system administrator for more information about the required app and settings. If something goes wrong while using the Internet with your new iPhone, then you can try resetting the network settings. The process erases and resets Wi-Fi information such as Wi-Fi networks and passwords, cellular settings, as well as VPN settings you have previously used on your device. The following steps may help you in dealing with network issues like if you can’t connect to the Internet, as well as if you cannot send/receive email or messages on your new iPhone. If prompted, enter the correct passcode. Note: Be sure to take note of your network credentials including those for your Wi-Fi network, Wi-Fi Assist, and Virtual Private Network (VPN). You will need to reconfigure these settings after the network settings are reset. Your iPhone will not be able to connect to a 3G or 4G network if Wi-Fi is turned on or enabled. 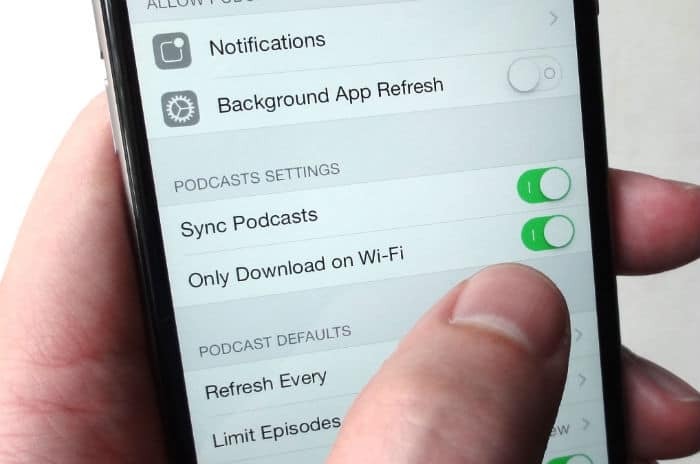 Some apps and settings on your iPhone are Wi-Fi reliant, thus an active Wi-Fi connection is required for them to function properly. Be sure to keep your Wi-Fi turned on to avoid losing connection while using the Advanced Calling video call on your new iPhone 7 Plus. If you encounter any problem or error while using Wi-Fi on your iPhone 7 Plus, be sure to take note of the error prompts and codes because they serve as clues to help you fix it. iPhone 7 Plus likes to randomly drop WiFi then when you go into settings you have no slide button to turn on WiFi and it shows nothing in networks. Restarting doesn’t work I’ve done the whole reset thing but the phone keeps doing this. Has anybody experienced this problem and if you have what did you do?